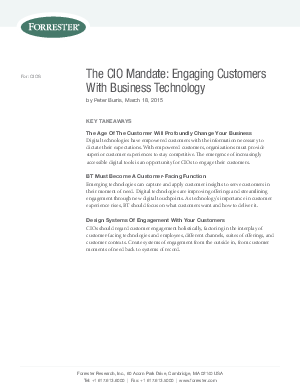 Read this report to understand how the age of the customer requires tech management to transform into a customer-facing function in specific ways. Business technology (BT) brings together technology and traditionally customer-facing roles like marketing, sales, service, brand/product management, and fulfillment for the purpose of deploying systems of engagement that provide differential customer experience. Firms must build these systems of engagement from the outside in, according to how customers move in market spaces. The rules for planning, building, and running systems of engagement are not the same as for previous generations of tech management because customers are not employees. The increasingly crucial role that digital technologies play in customer engagement elevates the CIO role in business — if CIOs can move beyond the traditional IT focus on technology assets and adopt an expanded view that centers on customer experience and choice.